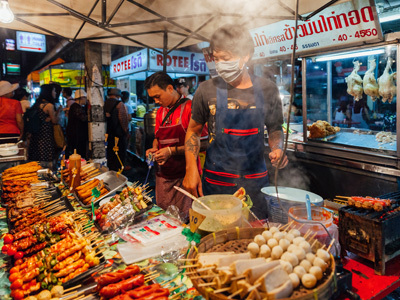 Come ready with an appetite for all that Thailand has to offer! On your custom anniversary celebration, you will be led on a tour of the classic highlights and hidden treasures of Bangkok, Chiang Mai and Phuket. Guided through the eyes of locals, you will have the opportunity to truly immerse yourself in the culture and understand the rich history. Between the bustling markets, flavorful cuisines, picturesque temples and wildlife encounters, you will be revealed into a world of wonders. 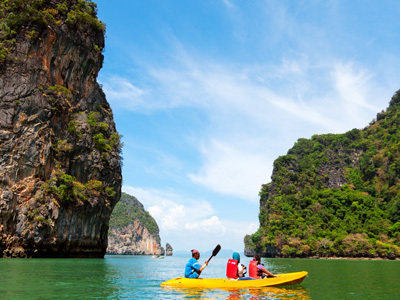 Discover the charm and embrace the traditions, before experiencing Thailand's iconic beach. Relish in relaxation, stroll the white sand beaches and take a dip in the heavenly turquoise waters...The perfect ending to your trip! 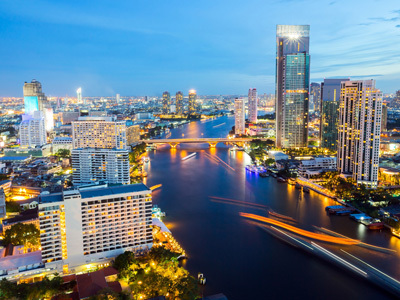 With a population of over eleven million inhabitants, the capital city of Bangkok is Thailand’s largest city. 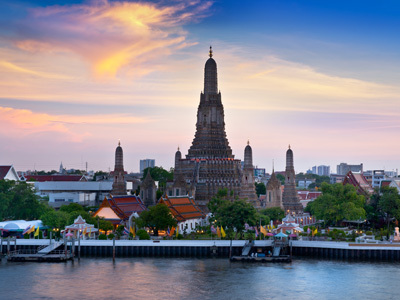 The wide variety of attractions, excursions and sights make Bangkok a vibrant and eclectic destination to explore, with something to keep any traveler entertained. This cosmopolitan city combines some of Asia’s oldest and most elaborately adorned temples, with modern shopping malls, impressive skyscrapers and bustling markets. 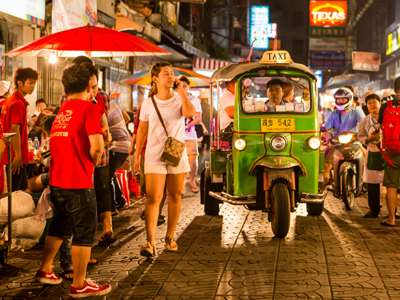 Take a ride on a Tuk Tuk one evening, to feel the cool tropical breeze and marvel at the bright neon lights. This morning at 10:30 AM, meet your guide and head to the Chatuchak Weekend Market where an estimated 5,000 vendor stalls cater to 80,000 visitors who are looking at purchasing everything from the mundane such as housewares and handicrafts to the bizarre like live snakes and live animals. Open only on Saturday and Sunday, this market spans many miles, and is the perfect place to barter for souvenirs and try some truly authentic Thai street food, or simply sit back, grab a drink, and watch the excitement. Your guide will accompany you through the maze of stalls and help you with your haggling skills. After exploring the bustling market, return to your hotel and freshen up before your Chinatown tour in the evening. 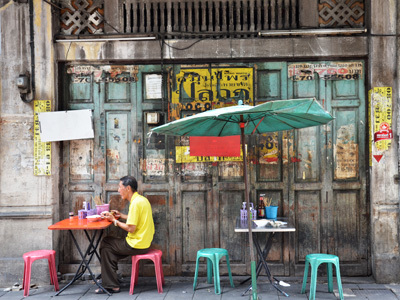 Enjoy a mouth watering exploration of Bangkok's 200-year-old Chinatown district this evening! You will have the chance to visit a variety of tasty eateries, from sit-on-the-pavement-vendors, to characterful restaurants. To begin the journey, your guide will transfer you from your hotel to the heart of Chinatown around 5:00 PM. Wander through the vibrant alleyways, and make your way to a local rooftop bar, from where you can admire magnificent views of the River. At this spot, you'll be given a short briefing by your guide, as you sip on a cocktail and marvel at the colorful sunset. Your guide and driver will meet you at the hotel this morning to be whisked away on an exploration of the city's highlights and hidden treasures! Your excursion begins with a visit to Wat Pho, one of Bangkok’s oldest and largest temples – famous for the 43 meter long reclining Buddha. From there, continue on to Lak Muang, Bangkok’s city pillar and the famous Grand Palace. Marvel at the Temple of the Emerald Buddha (Wat Pra Kaew), the most revered shrine in the Kingdom. This afternoon, you will be transferred to a local village to meet with a Raunkaew-Yanon family, who arrived in the area possibly on the back of an elephant, almost 150 years ago. They are a Lanna family, continuing the traditions of many generations in building their homes of teak wood and maintaining the natural surroundings in a way now rarely seen in Chiang Mai. Of course this is not your average commercial cooking class as you will learn more about their culture, the way of living and the architecture of a traditional Thai house and rice barn. Chiang Mai is the second largest city in Thailand and the gateway to the charming northern region. Explore the cultural highlights within the old city walls, discover fascinating temples, dig into the delicious street food and take a stroll through the famous evening markets, to truly experience the spirit of this destination. Chiang Mai serves as an excellent base for outdoor and adventure lovers, offering idyllic opportunities for trekking, cycling and river rafting in the surrounding countryside. The region is also home to many elephant conservation camps and ethnic hill tribe villages. At 2:30 PM it's time to say goodbye to charming Chiang Mai and head down to southern Thailand, today. This afternoon following your cooking experience, you will be transferred to the airport in good time to board your domestic flight to the picturesque island of Phuket (via Bangkok). 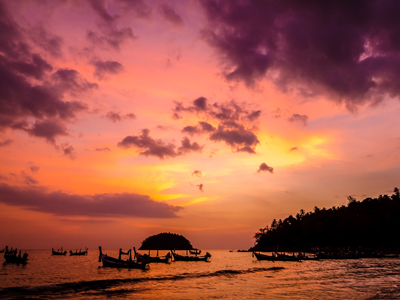 Phuket is Thailand's largest and arguably most well known island. The island's size contributes to it's diverse offerings in accommodations and experiences, from luxurious secluded pool villa properties to boutique resorts close to all the action - restaurants, shopping and nightlife. Phuket also serves as excellent base for those looking to explore the surrounding marine parks, jungles and nearby islands. Spend this free day relaxing and soak in the easy Island life. Explore the beaches and take the opportunity to experience the tranquility. Following a relaxing morning to enjoy the amenities at your hotel, you will be picked up around 11:00 AM and transferred to the pier. There, you will board a boat for the one hour journey to Phang Nga Bay, as a light lunch is served on board. This bay is part of the incredible Ao Phang Nga National Park. You will spend the afternoon today exploring several sea caves (also known as hongs) by canoe and discovering the unique wildlife within them. You will learn all about their creation and the unique ecosystem the area now boasts. Your activities will depend on the tides, although typically you will visit at least four different caves, on top of the time reserved for swimming and paddling around on your own. Today you will be picked up from your hotel for a foodie exploration of Old Town Phuket. So much more than just a beach destination, Phuket was once major trading center on the route between India and China, frequented by Portuguese, French, Dutch and English traders. Phuket's historic old town offers tantalizing glimpses of this era amid its Thai, Chinese and Muslim shrines, temples, markets, shop houses, cafés and museums. The contribution of foreign influences has produced a cuisine that you won’t find anywhere else in the world. 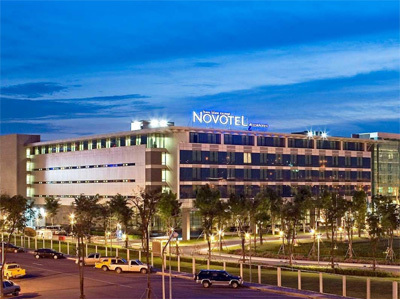 Upon arrival in Bangkok, proceed to the arrivals area, and look for the Novotel Suvarnabhumi’s hotel representative. They will direct you to the hotel’s complimentary shuttle service, for a smooth and easy transition into this evening. The shuttle picks up outside, between Gates 4 and 5 on the arrivals level, and departs every 5 minutes. Alternatively, you can access the hotel from the airport’s main terminal, via the 200-meter, air-conditioned underground walkway. Sadly, the time has arrived to say goodbye to beautiful Thailand. After checking out of your hotel, you can take the hotel’s complimentary shuttle service to the airport. Alternatively, you can access the hotel from the airport’s main terminal, via the 200-meter, air-conditioned underground walkway. We hope you had an incredible anniversary trip and we wish you safe and pleasant travels onward! 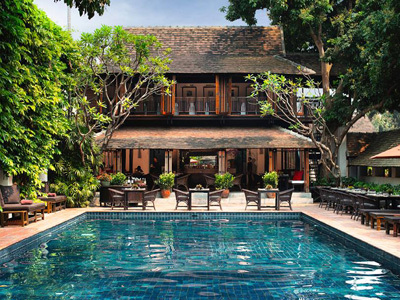 Tamarind Village is a unique and charming boutique property that is nestled in the heart of historic Chiang Mai. Surrounded by ancient temples and quaint shopping streets, it takes its name from magnificent 200 year old tamarind tree that shelters the hotel in a shady embrace. Set around a series of garden courtyards, the 42 guest rooms and 3 suites reflect the rich ethnic diversity of northern Thailand by using fabrics and patterns drawn from various tribes of the region. Intimate, serene and relaxing, Tamarind Village is an oasis of calm and tranquility, the perfect base for exploring Chiang Mai and beyond. Mom Tri’s Villa Royale is a boutique hotel situated on a headland overlooking the Andaman Sea and the white sand beach of Kata Noi. Villa Royale is a personal creation of renowned artist and architect Mom Luang Tridhosyuth Devakul, better known simply as Mom Tri, who is a descendant of the King Mongkut Rama IV. Mom Tri opened his private summer home eight years ago to provide guests with a truly royal experience. Thirty-five suites offer the highest standard of privacy and comfort in Phuket’s last hideaway. Alluring glimpses of its distinctive Thai-style buildings, authentic Thai antiques and art, luxurious modern comforts, panoramic sea views and lush tropical gardens create an atmosphere of calm and tranquillity. Landscaped into the rocks, overlooking the sea, is a lovely saltwater swimming pool; also there are 2 fresh water swimming pools. A private path from the hotel leads to the sugar white sand beach and turquoise water of Kata Noi. The Novotel Suvarnabhumi Airport is conveniently located a 10 minute walk from the Suvarnabhumi International Airport in Bangkok. Ideal for quick stopovers and comfortable relaxation en route during your adventures, the hotel features 612 contemporary rooms, tropical garden landscapes and pure serenity in urban luxury. With all of the necessary amenities for an enjoyable stay, you can also take advantage of the 2 trendy bars and 4 restaurants on property. There is a 24 hour airport shuttle that runs every 10 minutes, offering you an easy and carefree travel experience. This is just one of many authentic travel experiences offered by Global Basecamps. If you are interested in more unique destinations to Thailand with unprecedented planning and extraordinary service visit our main Thailand tours page to browse other sample trips.